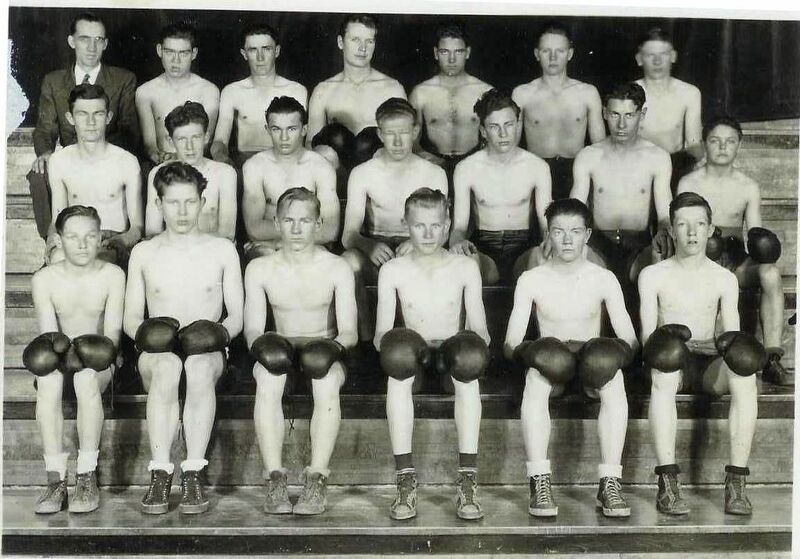 Note: John (Gene) Crowley appears in the center of the top (back row) in this photo of the Lemmon, SD, High School boxing team. Jack Randall is next to him on his left. John Portney is on his left at the far end. My first three years of high school in Lemmon, South Dakota, I played football—pretty much without incident until a game at Mobridge, South Dakota. I was playing center when a tackle on the Mobridge team started hitting me in the nose. The center is at a disadvantage, because he is passing the ball back between his legs. The second the ball is passed, the defensive linemen try to push past the center to tackle the ball carrier. This tackle did not try to push past me he just hit me in the nose each time I passed the ball. Soon I was a bloody mess and nobody paid any attention to the beating I was taking. After about the fourth play in which this happened, I had had it. Instead of passing the ball I just stood up and knocked the offending tackle cold. Of course, I was suspended from the game. But, I was always glad, and still am, that I delivered justice when it was needed. The following year after the Mobridge game, I decided to leave football. Between playing dances [see previous post] at night and all the other school activities, and with working in restaurants and all the other things going on in my life, football just didn’t measure up. Soon after I left the football team, a Mr. White formed a boxing team and he asked me to take part. Since I had developed some expertise up to this point, I agreed. On the boxing team, I fought heavyweights and light heavyweights. At the time, my weight ran 185 to 190 pounds. So, I was able to fight in both weights. The first fight arranged for me was in the town of Mott, North Dakota, a farm town. When I stepped in the ring, I couldn’t believe my eyes. My opponent was a huge muscular farm kid, black visaged, scowling, about 6`2" and about 200 pounds. I was secretly terrified. This guy was going to break my neck at least. We came dancing out of our corners in the first round and he swung a big, awkward blow just grazing the tip of my nose. My nose started to bleed, as it always does. I had seen some pretty good fighters and I knew some of the psychological tricks that were used. I smeared the blood around on my face, messed up my hair, and made weird faces at this fighter. He took another awkward swing at me and I nailed him—a right hook right on the chin. He went down without a sound. But he didn’t get up, he was paralyzed. The word got around from that fight, I guess, and the instructor couldn’t get fights for me. I fought a couple, but they were easy. When the team fought, most of the time my good friend, Jack Randall, and I would put on exhibition fights. We almost always fought to a draw, neither of us being able to do any great damage to the other. 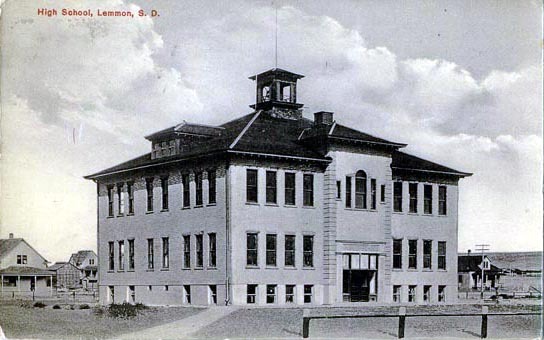 Note: The photo of Lemmon High School is from 1914, twenty-one years before John (Gene) Crowley attended. After high school, I fought a couple of carnival fighters. They were billed as ferocious man killers. If you could stay with them for three rounds, the carnival would pay you $15. Since that was a small fortune to me, it didn’t take much convincing. There were some great fighters among the carnival crowd, but I never drew one. Every fighter I drew was a pug who had seen better days. I felt very sorry for them and just stayed with them long enough to win my $15 without getting hurt or doing a lot of damage. My adventures were very, very mild compared to the experiences of my brothers, Joe and Neal. I have covered some of their exploits before. Suffice it to say, they were considered to be—without exception—the toughest fighters in the entire territory. One would think, on the face of this, that they must have been mean critters. The truth was that Joe and Neal were among the most loved and respected men in that country. They didn’t take advantage of anyone. They fought to defend their honor or that of some other person. One of my more memorable fights was the Fourth of July, 1940. Neal, my brother, was promoting fights in Faith for the July 4th celebration. He had booked me to fight a leading fighter from the Cheyenne Indian Agency at Cherry Creek. This Indian was supposed to be greased lightening and had a knockout punch in either hand. To tell the truth, I was plenty worried. I wasn’t so concerned with getting hurt as being humiliated and defeated in my home town. The night of the fight arrived and the Indian boy didn’t show. But Neal had another fighter, so all proceeded as planned. When I stepped in the ring, I could not believe my eyes—my opponent was John Portney, a fellow boxing team mate from Lemmon. I had so out classed John when we were in high school that they had never matched us. Seeing John here as my opponent was a big let down. He did not have the ability to show a good fight, and it would make me look bad. We came tearing out of our corners so determined to finish each other off, they had to stop us and make us start over. Like I said, this was going to be too easy. Then the blows started—one after another—accurate as any target practice, banging my belly like I was a stupid amateur. About the second round of this unmerciful beating I was taking, my second informed me that I was delivering a good upper-cut but I was not connecting with it. He advised me to perform exactly as I had been, except now take another step forward every time I threw the uppercut. I performed exactly as the second advised me, and the next round John went down. The next round, he went down again. I was still suffering from the beating he had been giving me, so even though I had him going, it was still a tough fight. He wouldn’t quit and we were both taking a bad beating. The uppercuts paid off finally and, although it was a close fight, I won the decision and the small purse. I lost track of John over the years. In the Old West tradition, like "Shootout at the O.K. Corral," "High Noon" and other Westerns with those swashbuckling two-fisted heroes, I grew up wishing to emulate these men. Gun fighting had been pretty well discouraged by valiant sheriffs, but a man was destined to defend his good name and the reputation of any damsel who might be within earshot. When I was in the second or third grade, the teacher accused me of doing something which I truthfully had not done. We kids, all of the class, were playing down the draw from the school house at recess time. Apparently she rang the bell for us to return and none of us heard it. When we thought our time was up, we hurried back to the school house where the abnormally large and flatulent middle aged teacher grabbed me by the arm and accused me of leading the children away. She then instructed me to get the bridle reins off my horse in the barn. I got the reins and gave them to her. She then folded the reins into double or triple strength and beat me severely over the back. When she got tired of beating me, she stopped and screamed, "Now what do you have to say for yourself?" I grabbed my bridle reins out of her hands, hit her once in her extended belly, and when she plopped on her behind on the floor, I walked out the door, got on my horse, and refused to go back to school until she was replaced. Since it was the beginning of the school year, I missed a whole year of school. But, the next year they hired an intelligent young teacher who allowed me to make up the missing year—in other words, do two years in one year's time. Hitting the teacher was not a very admirable thing to do for any student, and I was never proud of the fact. The plus side of the adventure, though, was that I realized I could defend myself. Since in those days there was no higher authority to appeal to, self defense was a pretty necessary measure at times. We boys always fought at recess. We were bored. We had no sports equipment. So, fighting was our only exercise. Although I fought many battles in those years, there was never anything spectacular about it. When they rang the bell, you always went back to class. I guess my point in this is that fighting was a common pastime and absolutely no one ever frowned on it. In fact, if you didn’t defend yourself, you would have been branded a coward or worse. Along about the fifth grade, my brother Neal brought home a set of boxing gloves and playfully set about teaching me to box. There was a boy in the neighborhood. He was adopted—and a real nice kid, who was in about the eighth grade. We put on the gloves one day with Neal supervising. Well, this kid, Ray something, was real hard and pretty tough. He hit me once in the chest, right over the heart and I slowly slumped to the ground unconscious. I remember it as though it was yesterday. It sounded like a fleet of airplanes going over, and then blackness. Being knocked out brought much ringing of hands and discussion about the necessity of fighting. But, I had learned a good lesson. If you beat the crap out of the other guy, you don’t get knocked out. I was always in a fight with neighbor kids. We liked each other and remained friends as long as they lived, but we were always at war in a friendly, competitive fashion. At school, we would play Cowboys and Indians. The Indians didn’t have any arrows. They used rocks. One day, we cowboys were on top of the barn, using the peaked roof as a fortress. I rose up to see what the Indians were doing, and at that precise moment, I caught a rock between the eyes. I remember starting to roll off the roof, but passed out before I hit the ground. I was only out for about a half hour. Except for lot of blood from the head wound, I was no worse for wear. Riding Lindy on a hot summer day in 1935, we crisscrossed Thunder Butte Creek doing nothing in particular, just killing time and, of course, dreaming about the start of my first year of high school. I didn’t really know what football was, having never seen a game. Football was not announced on the radio, there was no television, and I rarely saw a newspaper. My friend, Manny Barthold, had just graduated from high school. He had a football sweater and he said that football was a great sport for a man. So, of course, I would be a great football star—for I was a man and powerful, so that was what I would do. At about this point in my day-dreaming, I spotted a piece of metal sticking out of the mud in the middle of the creek. You didn’t just ignore a piece of metal. I took my rope off the saddle and tossed a loop over the metal object, cinched the rope fast in a simple loop over the saddle horn and gave Lindy a nudge with my heel. Nothing! The thing wouldn’t budge. I took Lindy to the other side of the creek bed and tried again. This time, the object moved slightly. After a half hour of back and forth pulling, Lindy put all of his weight behind the effort and the object came free of the mud. It just looked like a giant ball of mud. But, the object that I had first seen and roped was the reverse pedal on the transmission of a model "T" Ford engine and transmission. Without further examination, we headed for home, dragging the bouncing engine behind us for the next eight to ten miles. When I got home, the mud had dried and was pretty well beaten off the engine. My dad helped and we managed to get the old engine up on a couple of saw horses, where it sat for a week or so. I kept eyeing an old "race-car" body that had been sitting, half buried in dirt down by Stove creek. Half of the engine was missing. It had one wheel and no tires. That old racer was a pretty miserable car, but I had an engine. Over the next month or so , I totally dismantled the model "T" engine, cleaned it with kerosene, pleaded with my brothers to find clean oil, which they managed to do, put it back to-gather, got it in to the old racer body, and started the search for old tires and wheels. Eventually, just in time to prepare for high school in Lemmon, I cranked the old engine. With a lot of snorting, it started and I drove the whole miserable thing back to the ranch house. After a lot of cleaning, polishing, adjusting, and tuning, the old car was finally ready for school. My Sister, Cece, was married and living in Lemmon then, so I was going to live with her and her husband while I attended high school. The day finally arrived with all my worldly possessions in the front seat with me, since there was no other storage space. The body was shaped like a shark. I cranked her up and off I was over the eighty miles of country roads in my race car to Lemmon and the life of a grown up. Well, school started. I ran the wrong way with the football. I got in fights because they called me a cowboy or a pretty boy or whatever they thought would make me miserable. That problem soon got solved, though, when the older kids discovered that, although I didn’t know what to do with a football, I sure knew what to do with my fists. Then, there was the race car. I was greatly admired because I was the only kid in school with a car—and a race car to boot. After a couple of weeks of riding this wave of popularity, some of us decided to visit Lemmon Lake, about ten miles out of Lemmon, in North Dakota. There were something like seven boys hanging on to the top side of the racer. We had a nice swim, and on the way back, we hit a patch of sand at the bottom of a long hill. The car jack-knifed, turning end over end about five times. The most severely injured was Pete Ginther, with a broken collar bone. Most of the kids had just gone flying off into the brush along side the road. We walked back to town and I never saw the old race car again. Lake Williams, North Dakota, is (was) a sleepy little farm town which consisted of the grain elevator, railroad station, farm implement company, a lumber yard, a large hardware store, an oil company, a post office, a Catholic church and a scattering of homes. The Gulden Brothers, Lee and Ben, owned everything but the post office, the railroad, and the Catholic Church. They also owned a large number of the homes in town. Lee Gulden, my uncle, (husband of Cynthia, my aunt) owned with Cynthia a large modern home at the north end of town. To me, fresh from ranch country, this was a marvelous place. It had an electric light plant in the basement, a large cistern and wells that provided hot and cold running water, forced air heating and it was painted. Each member of the family—Lee, Cynthia, and Tracy owned cars. Tracy was given a car when he was barely old enough to see over the dash and had difficulty reaching the brake pedals. My first summer with the Guldens was when I was about four or five years of age. I remember my size and age well, because my grandmother spanked me soundly when Tracy slammed the screen door on her one day and broke her glasses. Of course, without her glasses she could hardly see, so she grabbed the nearest small person she could catch and that happened to be me. Tracy was a constant pain in the neck to me and to the other kids in town who had to put up with his antics. An example of the tricks perpetrated by this small boy was one summer day when a bunch of us kids were wading at the lake and Tracy got the idea of making cigarettes out of sea weed. Since Tracy was the first to try it, he was the one who smoked the most. Soon he became ill and the rest of us had to carry him back to town. He kept groaning and moaning and telling us how sick he was. But, as soon as we got him home he jumped to his feet, jumped on his bicycle and away he went, good as new. Another thing Tracy was good at was conning his father and his uncle Ben out of money. We would go to the store and sit around looking wistful and bored until uncle Ben gave Tracy 50 cents, cautioned him to give me half and away we went to buy candy. That was fine, except Tracy would buy candy for himself and laugh at me. One day when that happened, I beat him up pretty good. Tracy never held any hard feelings, since he new he brought it on himself, but his parents watched me carefully from then on. I guess they thought I was a thug. As I had mentioned, Tracy had a car from the time he started school. There was hardly anyone he could hurt, but himself. It was not like someone with a car today. The first thing he did was take the muffler off, then he would race up and down the roads between all the little towns in that area—Robinson, Pettibone, Steele, and others. We also used to drink beer. Since the Guldens supplied nearly all the money in the area, no one took a chance on refusing any of Tracy’s whims. We would go into bars in Robinson and Pettibone, the two nearest towns, and the bartender would give us beer, usually for free. I don’t recall that we were ever drunk, probably because we didn’t really care for the stuff. It was largely bravado on our part. A few sips and we would leave it. As I grew older, I still spent summers with the Guldens. We still raced up and down the highways between the little towns, but now there were girls with us. Of course, we had little interest in the girls, except they were some kind of strange creature who also happened to be nice friends. One of the kids in town who used to be a pain in the neck to me, was a kid called Cooper, I don’t remember his first name, but it was probably Gary. They were naming a lot of kids Gary in those days. Gary was bigger, taller, more athletic, handsomer and more sophisticated than any of the other kids, although we were all roughly the same age. Every time we would see Cynthia, she would recount all of the latest exploits of Gary. He had gotten a scholarship; he was valedictorian; his mother was going to take him to Hollywood. He was just too talented to do what ordinary people did. So, you can see that I got really tired of hearing about the "great and wonderful" Gary. One day, after I had been playing football for awhile (probably a junior in high school), I was visiting the Guldens when Tracy, Gary, and I decided to walk around the lake. Tracy and Gary were racing down the sands when I called to Gary, "See if you can break my tackle!" Then, I ran after them and threw a magnificent flying tackle at Gary. My shoulder hit him right above the shoe laces. It was a classic "shoe string tackle". The sand was soft and there would normally have been no harm done, but Gary went down—splat! I reached a hand out to help him to his feet. But, to my consternation, he lay on the sand curled up in a fetal position and crying like a little girl. I guess that was my introduction to the machinations of mice and men. I had no idea what was wrong with him. Tracy told me later that it was because his mother had him in Hollywood. That just deepened the mystery. Poor Gary. About five years ago, I read in the obituary column of the Sacramento (California) Bee that Gary, born in Lake Williams, North Dakota, had finally passed away. Gary never did make pictures, to my knowledge. If my recollection is correct he had been a real estate salesman. A few miles to the west of Lake Williams was the homestead of my grandfather and grandmother Shockley. They lived in a small tar paper house on about 80 acres. Separating them from Lake Williams was a large alkali lake. It had a smell no one could ever forget. They lived on that homestead until they were into their nineties, and then Cynthia moved them into her house in town where she could care of them more easily. 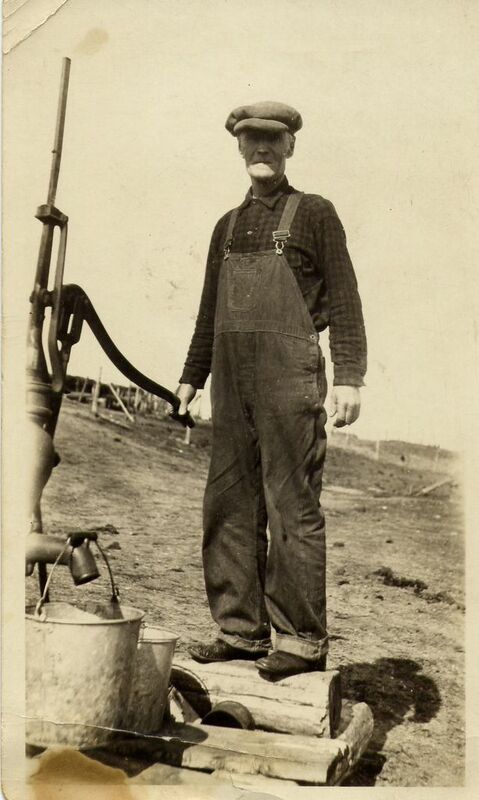 One of my fondest childhood memories was walking to the well with my grandfather. He would always hold my hand, even when he was carrying a large bucket of water. I have probably given the impression in trying to depict life on and around Thunder Butte that life was dumb, desperate and destitute. Nothing could be further from the truth. Those were the happiest days of my life. We also took numerous trips, vacations and outings. These trips were usually in the company of Cynthia Gulden, my aunt, her children, Tracy and Vernice, my mother, my sister Cecilia, and myself. I recall one trip when we toured the Black Hills, stayed in tourist cabins and spent about six weeks, just enjoying the Black Hills. My cousin, Tracy and I had the time of our lives, playing in the mountain trout streams, crawling over rail-road trestles, playing with other kids, and shopping with our parents. 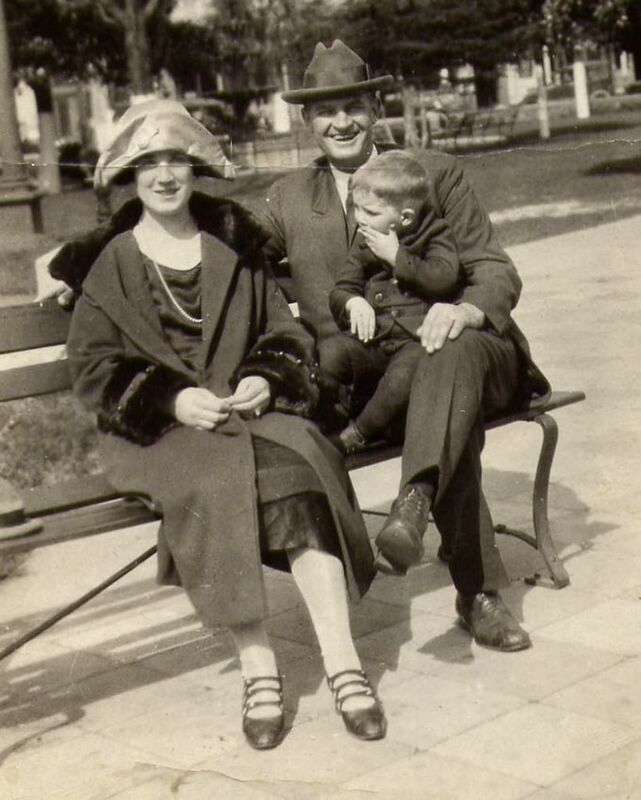 This vacation trip was about 1927. 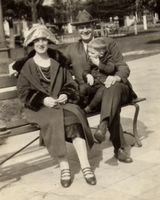 In approximately the year 1930, my mother, Cece and I took a trip through Yellowstone Park. For the life of me, I cannot remember who had a car, who did the driving, or much of the details of the trip. I believe that Cynthia’s husband, Lee, took us on this trip. We first went to Anaconda, Montana where we had an extended visit with my mother’s half sister, Mabel Van Sicklin. Mabel’s first husband, Petersen, had died and she had later married a Van Sicklin who was an electrician at Anaconda Copper. He was later accidentally electrocuted at work. My cousin Lester Petersen, the same age as Tracy and myself, went with us to Yellowstone Park. After the Yellowstone Park trek we all returned to the ranch by Thunder Butte. Tracy was very spoiled. He always did just as he pleased and everyone else had to go along with him. Well, Tracy had a .22 caliber rifle, which he carried everywhere. We were sitting in a car, in the front seat one day. I was on the driver’s side, Tracy in the middle, and Lester on the passenger side. I didn’t notice what Tracy was doing with the rifle, but there was a muffled explosion and he shot Lester in the knee. Lester was treated for the wound, but he had trouble with that leg for years and probably has trouble with his knee to this day. He lives in Pleasant Hill, California. Tracy wore himself out and died many years ago, in Lake Williams, North Dakota. In the summer of 1935, when I was 13 years of age, my sister, Cece was married to Floyd Theodore (Ted) Dickinson. Ted’s father owned and operated the Consumer’s Grocery, a wholesale and retail grocery company in Lemmon, South Dakota. In the summer of 1935, Ted was dispatched by his father to travel to Yakima, Washington, and contract for a railroad car of apples for their store. Ted wanted company and I agreed to go along with him. This was a pretty uneventful trip unless you can say that not stopping to sleep was an event. Ted drove night and day, stopping only for an hour or so now and again to catch a few winks of sleep. He had a brand new 1935 Ford coupe and it went very fast. When we arrived in Yakima, Ted drove immediately to the warehouses where he contracted for the railroad car full of apples to be shipped to the grocery in Lemmon. Then, after getting something to eat, we started on the road back to Lemmon. After Ted had driven about 100 miles to Ellensburg, Washington, he stopped the car and said to me that he was unable to go any further without sleep. He then asked if I thought I could drive for awhile. Of course that being a great opportunity, I agreed and I got behind the wheel. From Ellensburg to Spokane was about 200 miles. The road was good and straight, so I had no trouble at all until I suddenly started running through stop signs. After having driven so far, without stopping, and probably going eighty miles an hour at the time, we had entered the Western city limits of Spokane and I didn’t know it. After whizzing through two or three stop signs, I got scared and shook Ted’s shoulder. He came to with a start and ordered me to stop immediately. He then took over and drove all the way back to Lemmon without again stopping to sleep or trusting me to drive. Well, it was a great experience for a 13 year old, and I didn’t even get a ticket. Later, in the school year, when I was 14, Ted let me drive the car again. I had a date with Vivian Kusler, the girl across the street. Unbeknownst to me, Ted had a five gallon can of oil in back of the seat. Somehow, I spilled that entire can of oil on to the floor of the car—again, without knowing it. To say that Ted was infuriated would be a gross understatement. I don’t know how he ever cleaned it up. I also worked in Ted’s father’s grocery store on Saturdays for awhile. I even sold some of the apples that he had contracted for on our trip to Washington. Most of the time they only allowed me to sell candy. I was pretty dumb. There were many other trips. Some of the most memorable were my summers in Lake Williams, when I stayed with Cynthia and her family. That will have to be dealt with at another time.